Cheated : The last rites. If you buy Osprey Publishing's 'New Vanguard 225 : Republican Roman Warship' you will be cheated. Like I was. This book is more poorly written than an undergraduate's first draft for their final project. I have ploughed through more than half, noting grammatical errors, format and style errors, factual errors and plain wierdness. It is too much to finish this task. I can only conclude that the manuscript was NEVER proof-read. When I first browsed thought this book I was glad to see a new title on a subject I am interested in. This and the previous seven blogposts detail why I was rudely disappointed. I can now see that the presentation is purposely designed to give an impression of eruditeness but this is a facade behind which the author conceals little knowledge of the subject. This may not be a criticism if one wears one's ignorance openly and presents facts and information rather than analysis and conclusion. Readers can then make their own minds up. This book is a confusion. Facts are incorrect or misused. The presentation is horrible. The written style is poor and inconsistent. We have already seen how poor the illustrations are but they are the tip of an iceberg of balderdash. What is more worthy of criticism are the passages that are lifted from previous works almost word-for-word. This is not something a serious author should do. Not so long ago I could tell students 'Don't necessarily believe anything on the Web'. Osprey has achieved the trick of reversing this advice so that printed materials seem decidedly dodgy. Many sentences beginning with BUT, SO, AND. Not total no-no's, but BAD STYLE. p.41 Seneca's De Benificiis does not have a XXth book. p.41 Seneca's LXXVIth letter promotes the idea that ornamented things are not necessarily functional. It does not support the idea ships were ornamented, especially not the ram. p.43 Seneca's VIth letter has nothing to do with ships. It is about 'Sharing Knowledge'. A short Glossary is given behind the title page. It has precisely 14 entries. It is good for nothing. It includes, for example, Thalamian(sic) and Zygian(sic) but not thranian, and a definition of 'Louvre'(sic). Go figure, as one could say as one's head implodes. Where does this sentence take the discussion ? No explanation is given. The 'Latin'? is not a direct transcription of the Greek - it would be 'phasiloi trieretikoi'. 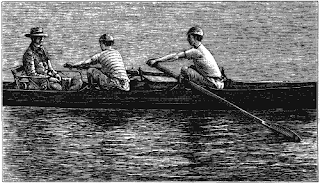 The term literally means phasiloi - merchant galleys - with three banks of oars , or at least 'in the style of a trieres'. 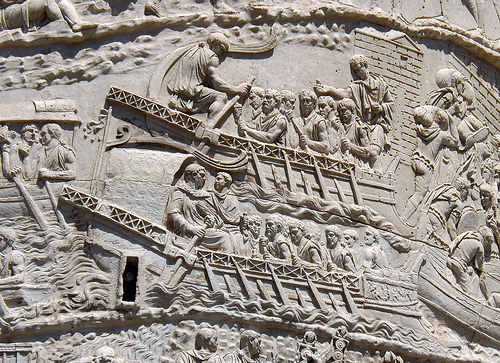 'The structure of ancient Roman oar-ships(sic) was generally the same as other ancient ships, albeit with some differences between types; they had a distinctive stolos (prow ornament), although similar to that of the Greek ships. 'WTF²! 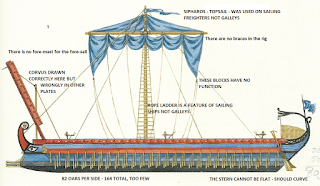 That Roman ship construction was the same as Carthaginians or Greeks is a major topic. 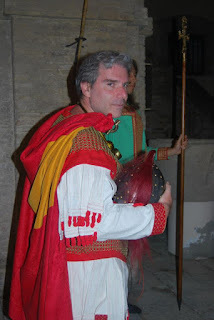 Was the Roman Four or Five made after a Phoenician or Syracusan predecessor ? This is a big question. Apparently it is not worth discussing here. This kind of 'writing' should not escape any publishing company worth the name's warehouse doors. There is a single footnote. In the whole book there is a single footnote. One. It is not illegal or impermissible to have an orphan footnote. To have an orphan footnote which makes reference to a work which is given in abbreviated form without explanation is carelessness. The referenced work is an Osprey publication. This kind of book should have lavish footnotes because it is a complicated subject or it should have none - the work of interpretation being clearly undertaken by the author and his thinking being laid out for the reader. It is customary to italicise words from another language. NOT if they exist and are used commonly in one's own language. NOT if they are misspelt. Repeatedly, quinquereme, and other ship types, are italicised. On the other hand, 'polyreme', which is a modern construct, created within the ancient ship fraternity, is also italicised. Latin and Greek nouns not capitalised in their own languages are capitalised here. Why ? I could go on , and on, and on, but life is short and I am bitter enough already. There is alot more i could write but the book is not worth it. Seriously, it was constructed to have a superficial appearance of credibility but examination reveals it is an amateurish production. Buy this book for a laugh. Buy it as a warning about how NOT to do things. Buy it as a support for a wonky table. Do not buy it to get wiser about Republican Roman warships. Sr D'Amato has no mention of this book on his FB page. I wonder why ? Maybe he feels let-down by Osprey Publishing's editorial input. Oh, and here is me, before anyone thinks it is unfair to show only the critiqued party. Yes, I really am throwing mud ! Rich, sticky mud. Oh the horror, the horror.. The text of Osprey New Vanguard 225 Roman Republican Warship, is a horror show. I originally read it as a glad fan of ancient ships eager to glean anything new or different, but.. The previous 7 blogposts I have made addressed the colour plates concocted for this book. As is the Osprey format it is these that sell the books. The text should also be examined. The main incentive for examining the text closely was provided by the examples of plagiarism I found in connection with the illustrations. What is lying in the long grass of the text ? If one then reads the book as I would students' submissions then I am AMAZED that it came to press in its current form. That is, if it was proof-read or subject to editorial examination. I do not now believe that Osprey have a meaningful editorial staff. The author is writing in a second language and a lot can be accepted on that basis. Shakespeare he is not. However, grammar, punctutation and consistent style can all be marked down a long way. I am in the process of making a short summary of the book's text. To deal quickly with plate A from Osprey New Vanguard 225. This FIVE is one of the best reconstructions in the book. Oh, but it is not Rava's work. It is a straight copy from Jeff Burns' illustration for John Warry's 'Warefare in the Classical World' with some twiddly bits added. 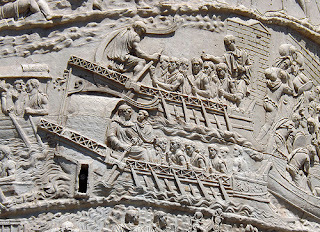 This bireme -liburnian has an oarbox and too many oars. This ship would be 36metres long, the length of a trieres ! Still More Fish in the Barrel! Let us now turn to Plate B of Osprey's New Vanguard 225. I will keep it as short as possible. There is a bolt-shooter mounted in front of the corvus. How is it lowered past this ? The corvus itself is wrongly drawn - Polybius states it is secured on the pole by a slot in the plank floor of the bridge. Here it stands on its end. There is no evidence for a corvus being mounted on a trieres - which is what this ship purports to be. trieres were so sensitive in their balance that a single man moving across the deck could disturb the stroke of the thalamian oarsmen. The weight of the corvus in raised position would give a lot of wind resistance and potential for overbalancing on this light ship. The steering oar - pedalium - is not hydrodynamic. it has a thick leading edge and a strong rib down the middle. The caption text is poor. It uses the Italian words for the rowers - not the latin nor relevant Anglicisation. 'zigiti' instead of zygians or zygitoi.' Talamiti' instead of thalamians or thalamoi. Traniti is replaced later in the caption by' Thranite'. This is a sign of poor or no proof-reading. The term 'orders' is used for the different levels of oars. Why ? Maybe a mistranslation from the Latin ordo/ordines for ranks. Ranks of rowers ? Some writers do use 'files' of rowers. 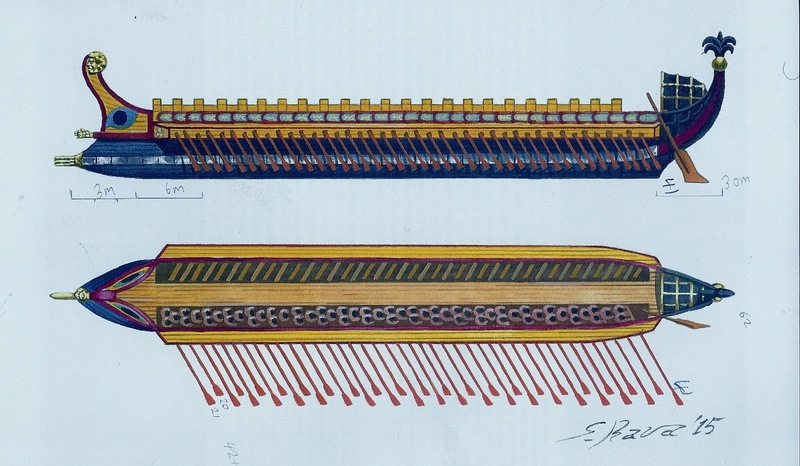 The parexeiresia is confused with the oarbox. The oarbox replaced the parexeiresia. 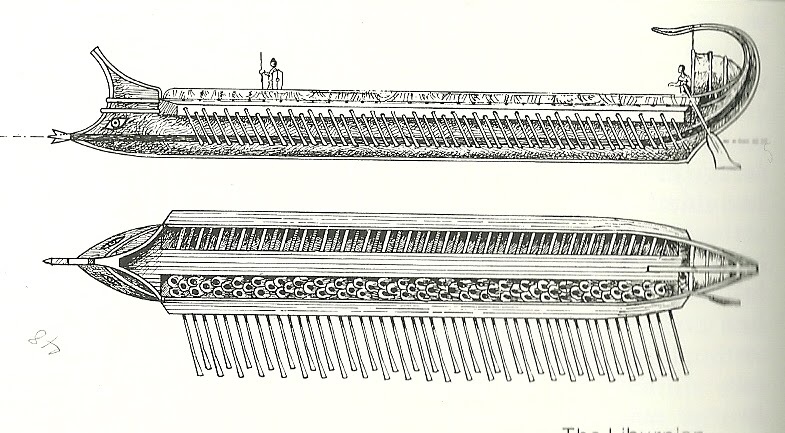 The upper level of oars rested over a rail projected out from the ship's side - this is the parexeiresia. In the third century BC it was replaced by a fixed closed box built along the ship side and the oars were worked through ports in this. A ventilation course is mentioned in the caption but completely absent in the illustration. The most worrying error in the caption are the references to oars. It is stated that the ship has 170 oars. Why, then, is the ship drawn with 178 oars ? Why ? talamiti - 'formed the lower row with oars 6ft long'. Read carefully. I shall say this only once. The key breakthrough in working out how a trieres is constructed and rowed was the realisation that the oarsmen should be arrranged on a radius so that the oars were all the same length ! Read any paper or book about Olympias and you cannot avoid this fact. 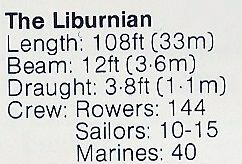 Lower man with a 1,8m oar ? Oh, yes and one could also think for a moment as to how useful an oar 6ft (1,8m) could be to a rower who is positioned so as to require at least 4,66m of oar to have an effect . To finish, it is stated that the ship - a trieres - carries 120 soldiers. The most a trieres is recorded as carrying is 40 soldiers plus the deck crew. Confused with a Five ? Now, is this from Alba Fucentia - as stands on a previous photo of the graffito or Alba Lucentia ? The author cannot make his mind up. Thanks, Osprey editorial staff. This ship is very special. This ship defies all research of the last thirty years to resurrect a nineteenth century idea about ancient ship construction. This ship is a 'Four', that is a tetreres or quadrireme. Much ink and almost blood has been spilled to determine that the '4' in the name of this ship does NOT mean it had four banks of oars. On the contrary, a tetreres should have TWO banks of oars, each double-manned. How thi stype of ship can be illustrated this way in 2015 is difficult to understand. Unless the closely collaborating author and illustrator do not have a clue what they are doing and there is no editorial control. There is also confusion here either in language or understanding, when a parados is referred-to as a 'guard-rail'. The parados is a narrow ledge outside the guard-rail where men can stand. Again. something appears in the caption, but not the illustration - poor collaboration again. The latticed ventilation course is referenced but not drawn in the picture. The last sentence is a pointer to the language difficulties of producing a book in a second language. BUT IT IS PRECISELY HERE THAT THE EDITORIAL STAFF SHOULD HELP ! The very fact that the ship is drawn with FOUR oar rows destroys the terminology of thranian-zygian-thalamian. In any case the sentence is confused and cannot be elucidated by looking at the picture. The upper oars would normally be termed thranite. In fact, the top two rows of oars seem to come out of holes in the top of an oarbox ! ? Do they bend down to the water over the edge of the oarbox ? Osprey New Vanguard 225 keeps giving.It gives one so much more faith in the illustrators of Look and Learn and their ilk. Despite the blurb, Osprey push out fodder for eager boys of all ages just as Look and Learn did. Plate H is all about a Liburnian. The Liburnian was a type of lembus. That is, a lighter ship. They were heavier than most lembi because they were cataphract - i.e. they had a deck which covered the oarsmen and hold, and they could be 'boxed-in' - i.e. 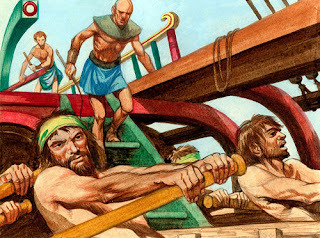 the oars were worked through ports to further protect the rowers in battle and from the weather. Possibly those used by the Romans were inspired in their design by the vessels of Illyrian pirates. Pirates prized speed and manoeuverability in a compact, light ship that did not require a large crew. The plate caption tells us that the reconstruction is based upon a liburnian of Agrippa from Isernia. The relief fragments, from the Santa Maria del Monache National Museum at Isernia, on the eastern side of Italy, are shown, in cropped photographs on page 39. Found in the River Sordo, near the Ponte Nuovo. Probably from a tomb monument, and to be dated in the years after the battle of Actium (31 BCE), there is nothing to link this relief with Agrippa as far as I can find.The only features the reliefs contribute are the prow volute ornament, the proembelion and the ram decoration. If we examine the rest of the caption we learn that the ship depicted has 82 oars 'dispersed in two orders'(whatever that means), that its length is 'about 108ft(sic)', and that its crew is 114 oarsmen, 10-15 sailors and 40 marines. No sailors or marines are depicted in the plate. 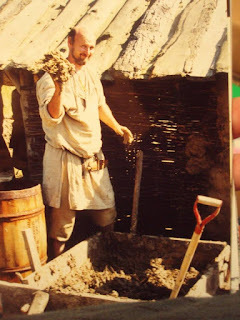 We also learn from the caption that ..
Now, call me a curmudgeonly old nit-picker but in 1995 John Morrison, writing in 'Hellenistic Oared Warships 399 -31BC' in Conway's 'The Age of the Galley' wrote thus..
Morison's construction is a little odd. A ram is essentially an offensive armament. The chances that D'Amato lighted by chance upon the same phraseology is slim. Him being Italian and all that. If we do the unmentionable and count things shown we find that there are, on each side, 20 single-manned oars and 21 double-manned oars on each side. Firstly, there is NO evidence for differently-manned oars in a dikrotic ship unless we are talking about heavier polyremes from a Five and up. 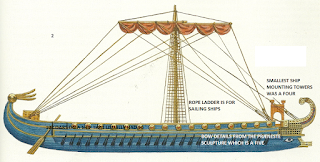 Dikrotic ships - biremes - are known from the seventh century BC down to medieval times. 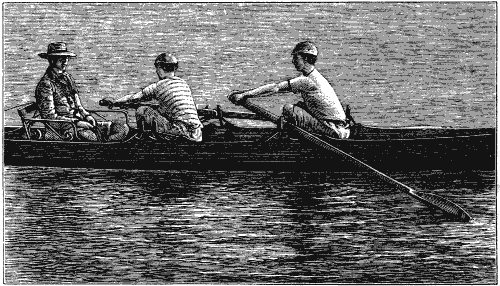 The only suggested case for double-manned oars combined with single-manned is that of the hemiolia, where the mid-half of each side on a MONOKROTIC ship could have had double-manning. Plate H here has a radical interpretation which is not explained or backed-up. Or it is plain wrong. Secondly, add 20 times 1, to 21 times 2. This gives 124 in my system of arithmetic. There are places for 124 rowers in this picture. The caption says there should be 114. Plain wrong. With all those men crammed into the ship let us see if there is space for them. Space in a galley is crucial. There must be enough space to work an oar effectively. We know from antiquity and from the Olympias project that the separation between oars should be in the order of a metre 21 oars on a single level needs 21 metres. The ship shown here is 108ft long (why feet ?). This is 32,4 metres. We do not know if this is waterline length or maximum length. 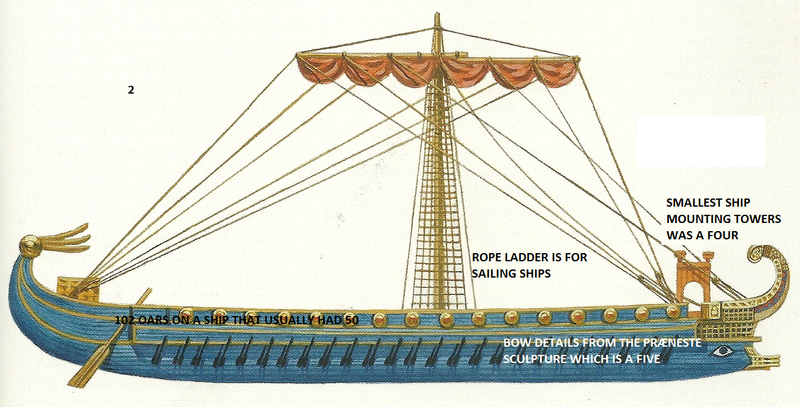 If the distance between the outermost oar ports is 20 metres this would give a ship, as depicted, of 27 metres hull length. The picture is too short. 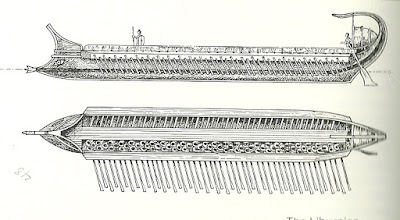 A Four is generally reconstructed as having 88 oars - 22 on one level. A Four is generally reconstructed as being 37 metres long at the waterline. Rather longer than this ship which has just about the same number of oars in a level. The reconstruction is plainly wrong. 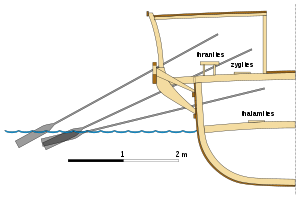 The ship shown in plate H has an oarbox. This is a straight-sided closed extension to the hull in which oarports are pierced. Both levels or oars are shown rowed through the oarbox. No ship of this size could have two levels of oars rowed through the oarbox. There is not enough space available inside the ship to allow oars to penetrate the box side and hit the water without having wildly different oar lengths. The smallest ships with oarboxes so large are Fours or maybe trihemiolia. The most likely configuration for a liburnian with an oarbox is that one level would penetrate the oarbox and the second issue from its underside. In fact, we have no evidence for a liburnian with an oarbox. They can be boxed-in in that they have sides with protection for the oarsmen but oarboxes ? No. In addition, it is essential that an oarbox is straight, because then the oars can be the same length. 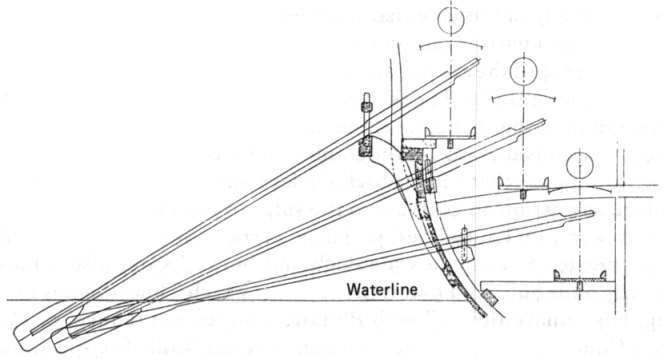 this drawing has the oarboxes tapered at the stern which defeats their function. The liburnians from Trajan's Column speak volumes. Incorrectly positioned oarsmen but no oarbox. These would have been decked and the lattice is ventilation in the sides. The men are sculpted larger than life-size compared to the ships. Should I go on ? I will. The profile shows a crennelated bulwark topping a layer of interlocked shields. Where is this structure in the plan view ? Is it represented by the red line running fore-aft ? If so, why would a protective deck bulwark be located where no one can stand behind it unless they tread on a rower's head ? How do they get the shields ? The caption states that the liburnae were 'decked and boxed-in'. In the context of galleys, 'decked' usually means cataphract - i.e. the deck covers the ship. Plate H shows a ship with an incomplete deck. It is at odds with the caption. All these details stirred some dusty entry in my mental archive. I checked New Vanguard 225's bibliography and, as one may expect, there stood John Warry's excellent 'Warfare in the Classical World'. In this book is an illustration of a Liburnian, by Clive Spong or Jeff Burns. Clive Spong or Jeff Burns' Liburnian has 48 oars per side. A liburnian with more oars than a Four ! BUT Warry wrote and his illustrator worked before 1980. Much has been discovered since. 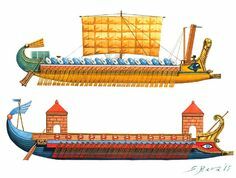 If we take the ratios of the oared-length to the total-ship-lengths on these illustrations we can see they are similar. Rava 1.44, Spong-Burns1,36. If we compare the pictures we see a tapered oar-box, alternate single then double-manned oars, an incomplete deck with an arrow shape and a similarity in prow plan, one side of the oar benches unoccupied., no plan representation of the bulwark shown in profile. It gives the impression of a colouring-in exercise on the earlier drawing. If we compare the details given alongside the drawing it is conclusive. Even though the number of rowers changes, the length is kept the same ? Why would one do that when many interested readers will have Warry's book on their shelves ? How could one concoct a ship which is essentially a trieres - having three men in each interscalmium and call it a Liburnian. We know from Sr. Rava's comment,previously blogged about here, that the author and illustrator collaborate closely to produce the Osprey illustrations. Neither can avoid credit for Plate H.
Jackson, Embleton, Doughty, Lawrence et al who lavishly illustrated the weekly comics of the past were working, apparently, in a similar vein to those hired by Osprey so many years later. Much more is known but this is not always applied due to pressures of time. At least Look and Learn did not claim to be the last word in historical and archaeological accuracy. Look and Learn was an exciting weekly magazine for young people and the broader-minded adult. Is Osprey doing anything more?